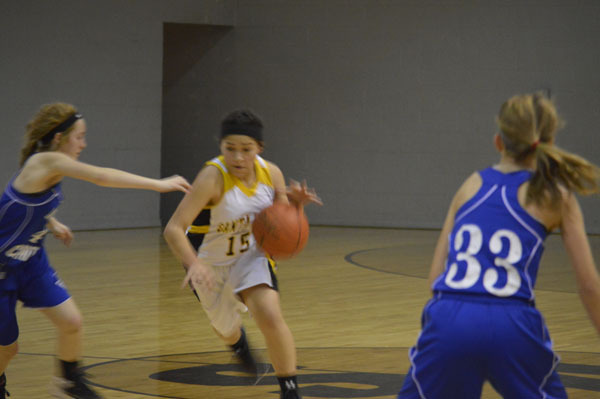 Santa Anna JH Lady Mountaineers played against Richland Springs Monday night in a very tough game. The girls made a few mistakes, but they worked hard and played a good game. They did not win the game, but we corrected our mistakes the second half, and that is a win in my book. Keep working hard ladies! Jr. High boys played Monday @ home, but came home with another loss against Richland Springs. Would like to thank all our Jr. Boys for their hard work and effort and playing to the end. Congrats to Lady Mountaineers on their 1st District win against Panther Creek. SA 57 to PC 30. Girls continue to work hard in practice and team goal percentages are getting better. Next game will be in Menard on Friday 18th. JV boys had three games this past week in Zephyr Tournament. Fell short on all three games. Congrat’s to boys for all their hard work. The JV girls played in the Zephyr Tournament last Thursday-Saturday. Thursday's game was against Albany, and we lost by one. On Friday, we played Zephyr and ended up losing by five. On Saturday we faced Blanket and lost again by one. All three games were very close and very exciting. The girls played very well and are improving every game. Nice job Lady Mountaineers! Congrats to our varsity Lady Mountaineers on their 3rd Place @ Lohn Tournament. Laci Donham was selected to the All Tournament team. Lady Mountaineers came home with 2 wins and 1 loss. Will continue to practice hard and get ready for district play on Tuesday against Panther Creek. Santa Anna vs Evant- Santa Anna started the Lohn tournament off playing Evant. The boys got off to a quick start and never looked back. Santa Anna beat Evant 80-31. Five of the six mountaineers scored double digits lead by Guy Watts with 25 including five from three point range. Santa Anna vs Lometa- Second round of the tournament led to the third game of the season and two in 4 days with Lometa. Lometa scored early with several transition points and built a quick 20 point lead heading into half. The game was called short due to ejections. The final was 61-28. Santa Anna vs Rochelle- The final game was against Rochelle. This game was for 3rd place in the tournament. Again, the boys had a slow start and were down by as many as 14 early on but only trailed by 8 at half. Miscommunications on defense led to easy baskets for Rochelle. Santa Anna never could make up the ground and lost by a final of 40-28. Our Lady Mountaineers fell short last night. 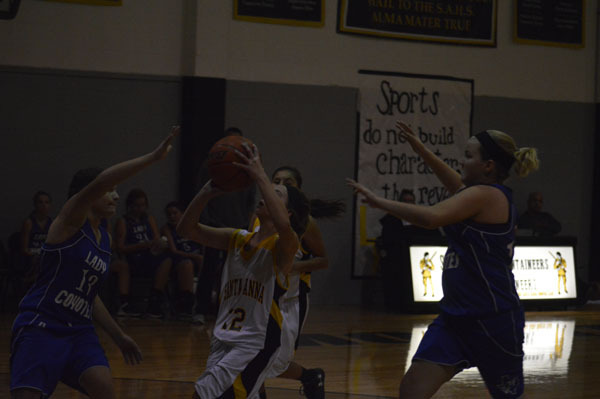 Lady Mountaineers will continue to work to improve their skills. Lady Mountaineers working well together as a team, showing improvement with team court awareness. 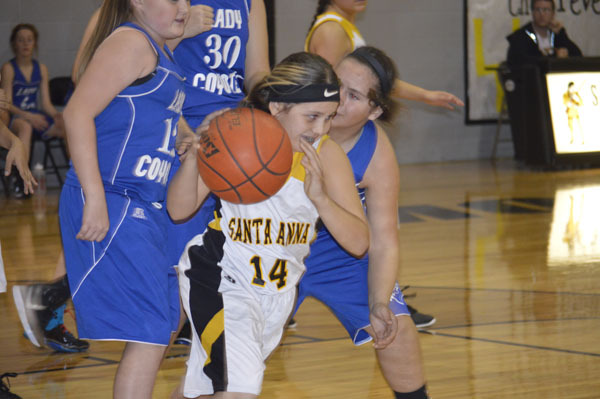 Santa Anna traveled to Lometa Tuesday night for a second chance against the hornets this season. The boys started the game off well with great defense and patient offense. They trailed the hornets by 8 at the half way point. The second half belonged to Lometa. The hornets stretched the 8 point lead out to 20 with fast break points and aggressive defense. Santa Anna never made up the ground and lost their second game to Lometa this year by a final of 63-41. Wide Receiver: Guy Watts JR.
Gustine Tournament Would like to congratulate the Lady Mountaineers on job well done this weekend. 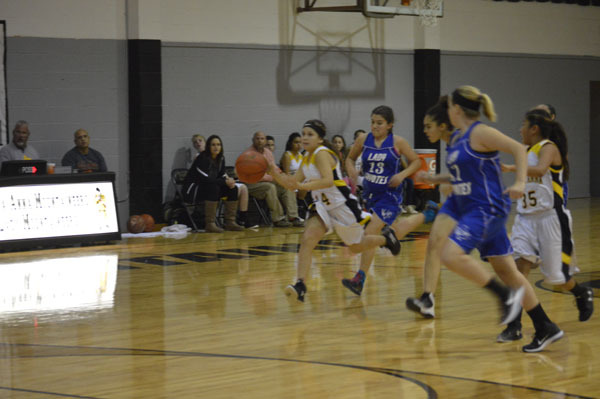 The Lady Mountaineers played in Championship game, but came short to Lady Stephenville Bees. Our Lady Mountaineers have been working really hard and taking one game at a time to prepare us for district play next week. SA vs Lohn- Santa Anna boys started the tournament with a match up against district opponent Lohn. The mountaineers didn’t waste any time building a big lead and adding to it throughout the game. The mountaineers tightened down on defense holding Lohn to only 6 first half points and 0 in the opening period. The boys never trailed in the competition and started off the tournament with a big win 45-26 over Lohn. SA vs Gustine- The mountaineers’ tipped off round two against tournament host Gustine, a rematch of Tuesday’s game. Santa Anna started off slow, finishing the first period leading by only 3 but took big control of the game by outscoring Gustine 23-0 in the second period. The mountaineers never looked back and took the game easily with a 52-16 win to advance to the championship game. SA vs DeLeon- Santa Anna boys faced DeLeon for the championship game. The mountaineers had a great start to the game, but couldn’t keep up as injuries and excellent perimeter shooting from DeLeon put distance between the two teams. Santa Anna trailed by 10 at half, and lost the game by a final of 45-22 to take second place in the Gustine Innovational Tournament. 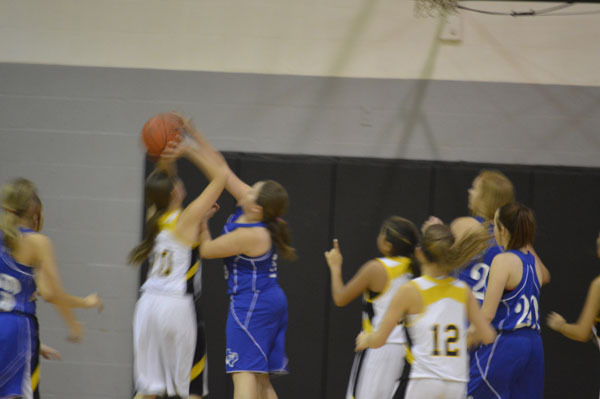 JH girls played against Rochelle last night and lost 22-17. They played well and are looking forward to future games. Go Lady Mountaineers!--Lishka Santa Anna –vs- Rochelle Jr. High Boys came up short last night against Rochelle, boys will continue to work hard in practice to prepare us for next weeks game. Jv girls played last night in Lohn against Zephyr's JV. The girls played a good game and hustled well, but ended up losing by 11. Good job lady mountaineers. Keep up the good work. Santa Anna 33 – Gustine 48… Our Lady Mountaineers came up short last night against Gustine. Our constant hustling on defense continues to help our team. Lady Mountaineers will continue to work hard on their skills in practice. Lady Mountaineers free throw percentages has increased, but will continue to work on our field goals shooting to improve our #’s. Lady Mountaineers will travel to Gustine Thursday, December 3rd to face Gustine once again in the Gustine Tournament. The JV mountaineers-boys took on Gustine JV to start the games for Tuesday night. The boys started slow on offense in the first half but scored some key baskets to get the win in a close game. The defense also stepped up getting a final stop with only a two point lead. The mountaineers earned their win with a final score of 18-14. The varsity boys also played Gustine Tuesday night. Offense was also slow starting off, scoring only 18 points at half. To help the slow offense, the boys had several steals for lay ups and established a good fast break game to build a small lead going into half. The second half belonged to the Mountaineers, outscoring them 23-9 in route to a 41-20 victory. The varsity will travel to Gustine again Thursday and Friday to compete in the Gustine tournament. 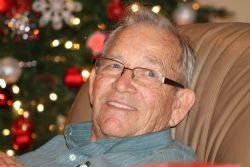 My father, Lance Gene Moore, passed away Saturday, November 28. Our family lived in Santa Anna from 1983-1990. We knew many people there and loved our time in Santa Anna. Lance Gene Moore, 76, of Lumberton and formerly of Bay City and Coleman County, died Saturday, November 28, 2015. He was born on August 3, 1939, in Jayton, to Sylva Rollins Moore and Frank Moore. Lance served his country in the United States Air Force for twenty-one years. He served during Vietnam and retired as a Master Sergeant. He also retired as a technician for National Cash Register. Survivors include his wife, Betty Moore; children, Scott Moore of Dallas; Casey Moore and his wife, Lorrie, of Logan, West Virginia; Becky Wojcik and her husband, Robert, of Sweeny; Shera Cameron and her husband, Scott, of Frisco; and Karen Herbrich and her husband, John, of Kountze; grandchildren, Dayna Hickman and her husband, Jake, of Baytown; Brett Moore and his wife, Samantha, of Lumberton; Ryan Wojcik, Katherine Wojcik, and Emily Wojcik, all of Sweeny; Sydney Cameron and Rachel Cameron, both of Frisco; and Krista Herbrich and Rebecca Herbrich, both of Kountze; brothers, Frank Moore of Redlands, California; David Moore of Pasadena, Texas; and Harold Moore of Conway, Arkansas; sister, Shirley Tolbert of Porter, Texas; and numerous nieces, nephews, and cousins. He is preceded in death by his parents; his first wife, Gala Marie Garrett; and son, Todd Randle Moore. A gathering of Mr. Moore’s family and friends will begin at 10:00 a.m., with his service at 11:00 a.m., Wednesday, December 2, 2015, at Crestwood Baptist Church, 1150 Highway 69 South, Kountze. His interment will follow at Hardin Memorial Park, Silsbee. In lieu of flowers, memorial contributions may be sent to Crestwood Baptist Church, 1150 Highway 69 South, Kountze, Texas 77625.